Winners of the Todmorden Calder Valley Shield and the Todmorden Amateur League. No defeats in any matches during the season. Back row: Archy Wilde, ? , C.F. Wilde, J.H. Tatham, W. Sutcliffe, R.D. McWhirter. middle row: C.Pickles, Albert Greenwood, Clifford Greenwood, Harry Binns, James Martin, Jim Chatburn, D.K. Greenwood. Front row: Arthur Dobby, Steve Bricknell, Harry Cockcroft, Raymond Ashworth, Captain, G. Binns, Dennis Halmshaw, J. D. Pinchbeck. 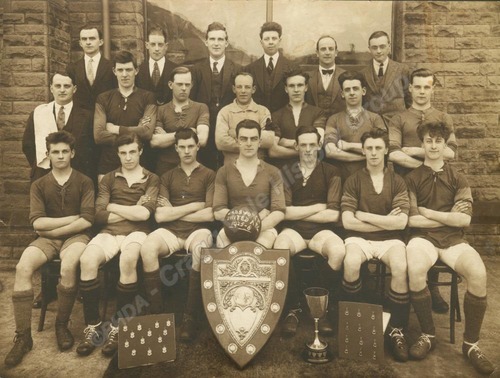 “Wadsworth United Football Team and Officials, 1926/26 Season - CVH00218,” Pennine Horizons Digital Archive, accessed April 22, 2019, http://penninehorizons.org/items/show/28866.